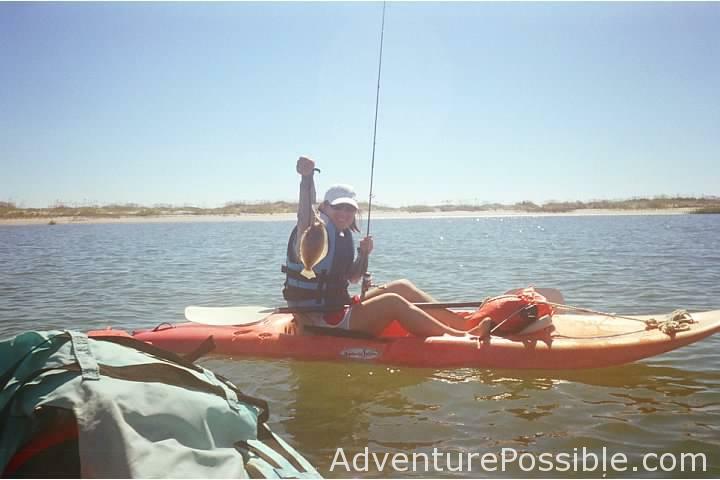 Kayaking and fishing around Lea Island, NC is a weekend kayak trip well worth it. Lea Island is a small island, about 3 miles long, and it is uninhabited. On weekends it can get a little crowded on the south and northern ends, but the middle of the island is visited more rarely and allows for lots of room to stretch out. 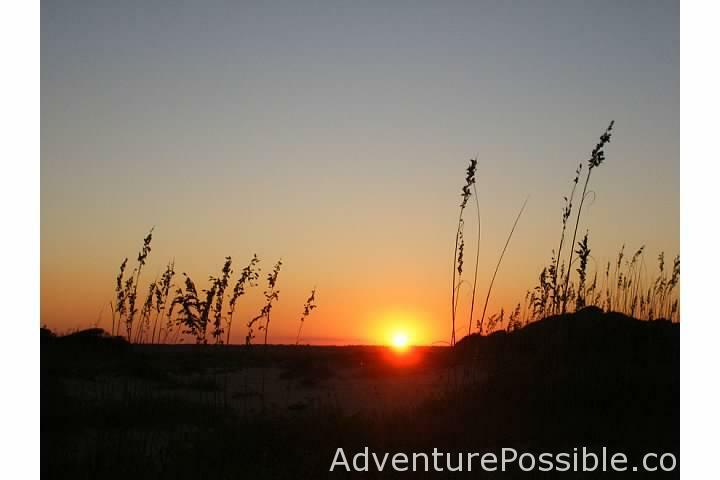 For starting and ending the trip, there is a public kayak launch on Topsail Island which makes a great point of entry for this trip. 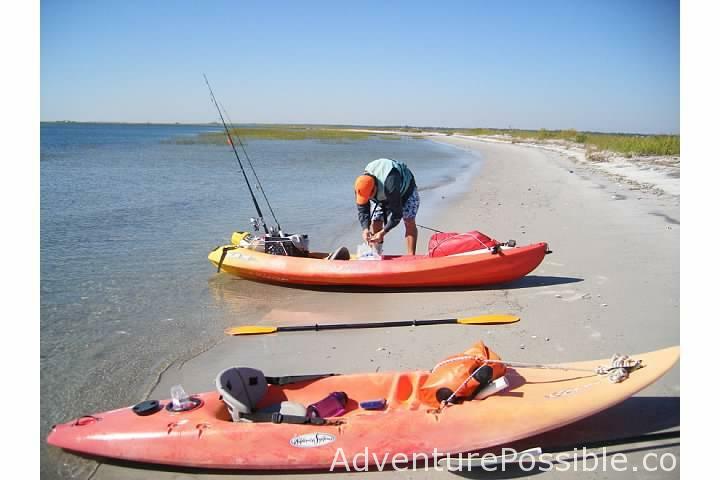 It can be completed on a single weekend, and it could easily be a long weekend kayak trip if you wanted to spend two nights on Lea Island. The trip was a moderately difficult. 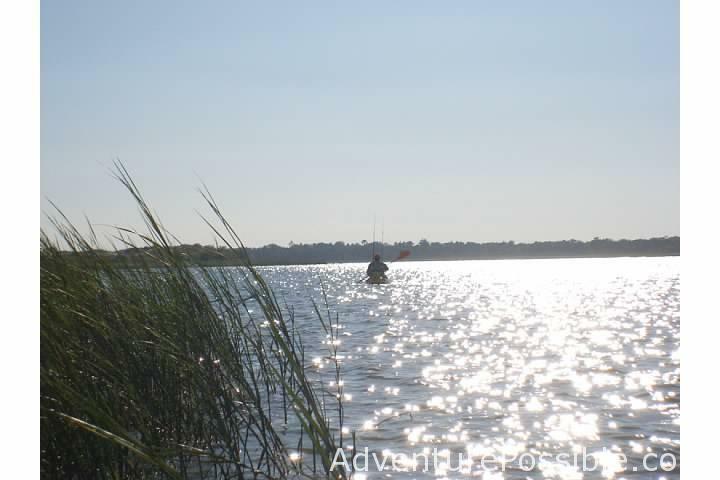 The most difficult parts for us were kayaking through two inlets, though we mitigated the risk by staying close to shore where we could stand up if flipped. 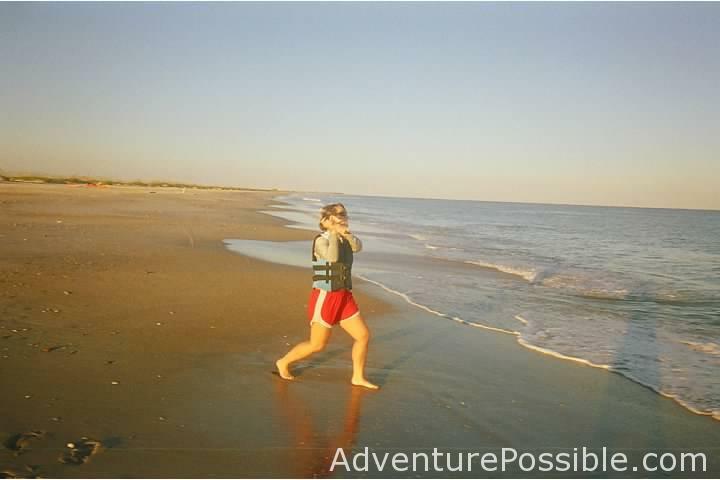 The currents were strong at Rich’s and New Topsail Inlet. 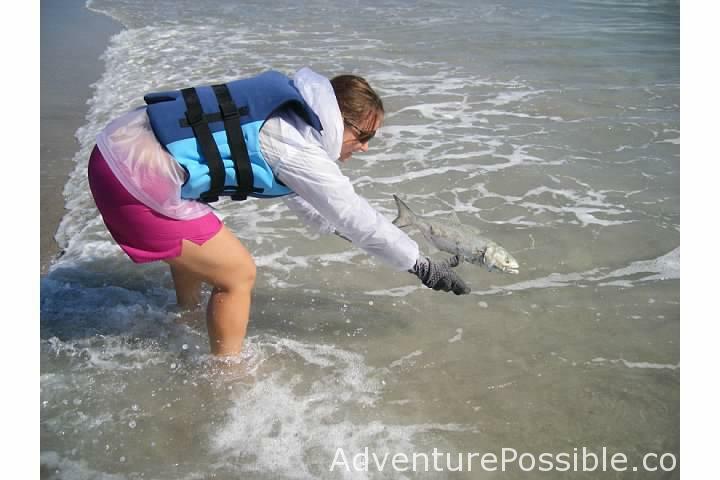 I’d certainly advocate for life jackets. 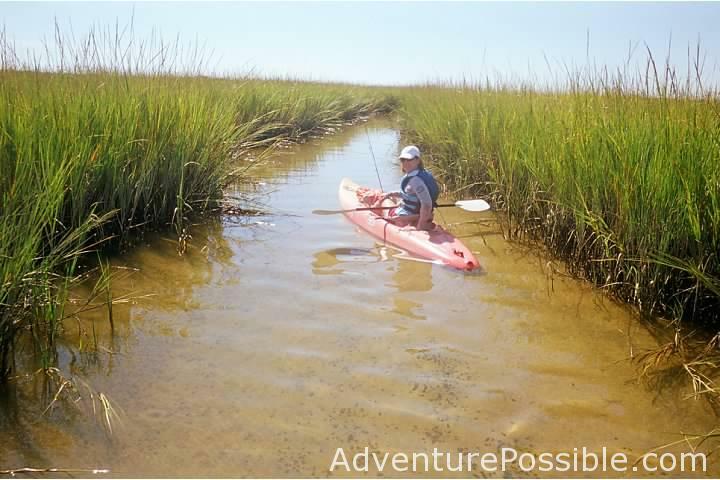 The other challenge was finding out way through the marsh behind Lea Island to the Intercoastal Waterway. We could have taken the broad, wide, and well-marked S-curve channel, but we decided to wind our way through some of the smaller creeks as we passed around the back of Lea Island. 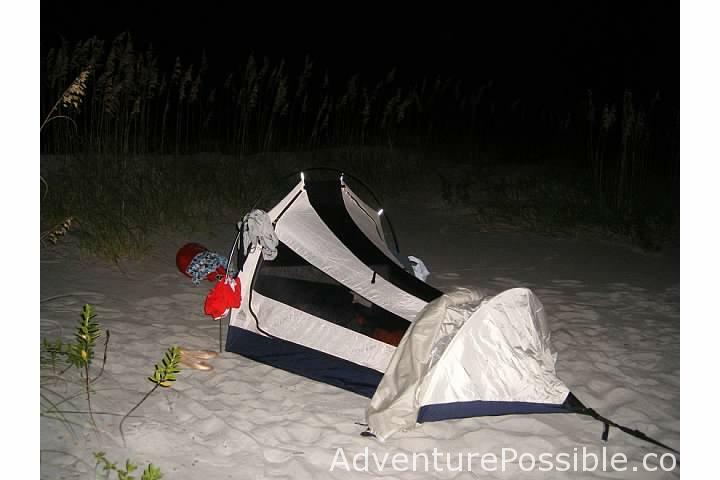 We tent camped on Lea Island at night (note: tent stakes don’t hold in the sand so plan for alternative.) We caught lots of fish and made a meal out of some of them. The island does not have any fresh water to my knowledge, so you have to pack enough fresh water for each person to drink, cook, clean, etc. 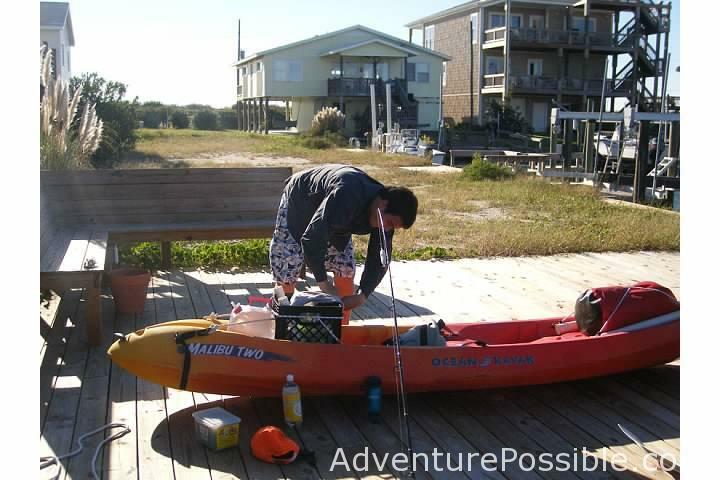 We used two sit-on-top sea kayaks for our weekend overnight kayak trip. I had a larger one, pictured above, and carried most of our camping gear. Katie paddled a much smaller one that we borrowed. It got the job done, but it didn’t carry much else besides her. Note: Lea Island doesn’t have fresh water, so we packed 11 gallons of fresh water for the weekend trip. 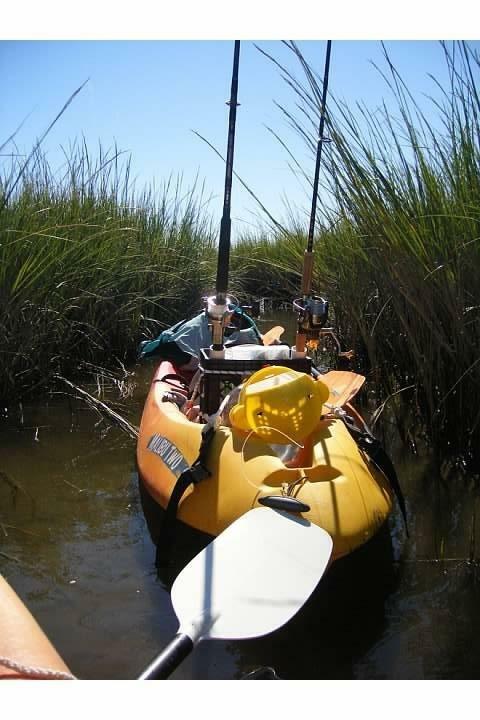 Our kayak took us through the marsh, along the Intercoastal Waterway (ICW), and through the near shore surf. 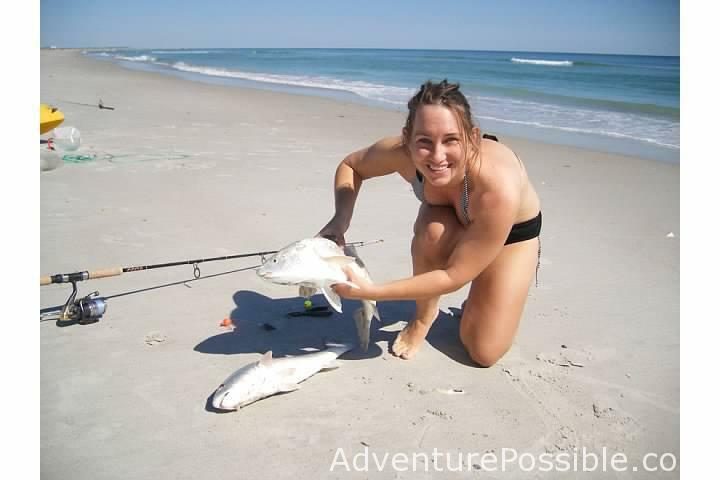 It didn’t take long into the trip when we decided to take a little break on a sandy beach for some fishing. 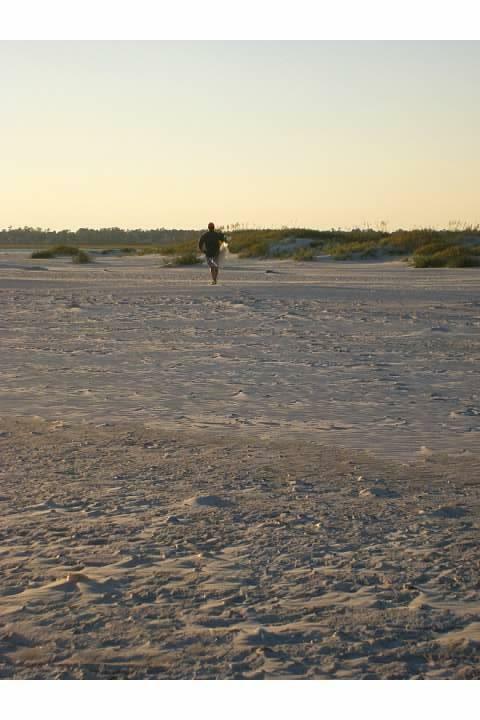 There was nice hard bottom out front of this beach on the Topsail Island side of the S-cure channel. 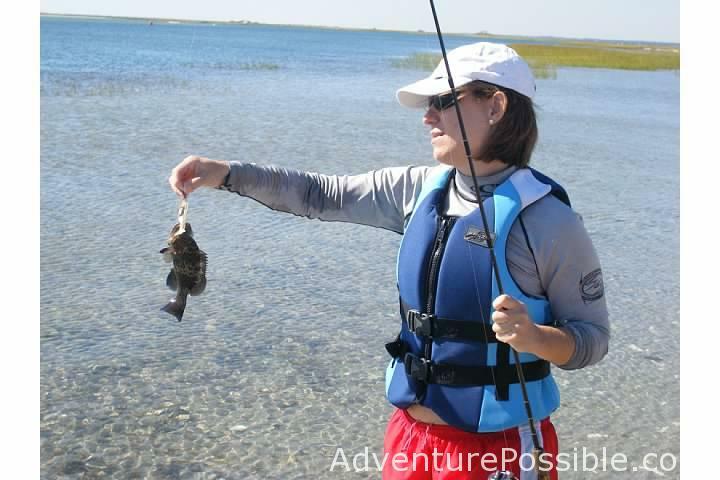 It held flounder and black sea bass. 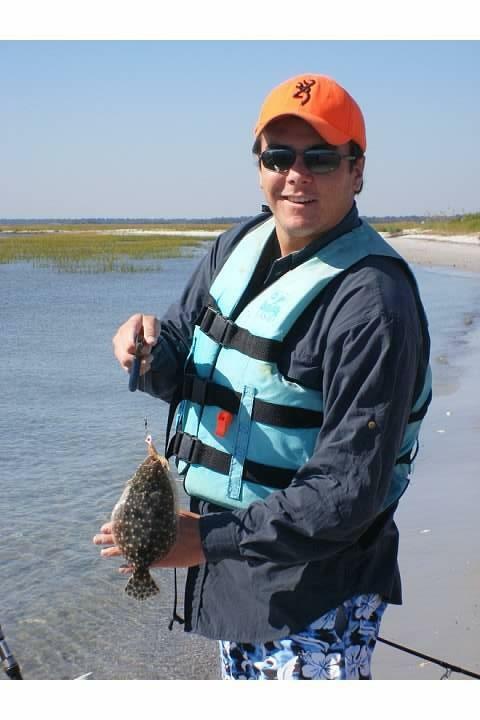 Caught this flounder on one of the first casts. Sign of a good couple of days coming. Even Katie got ahold of some fish. 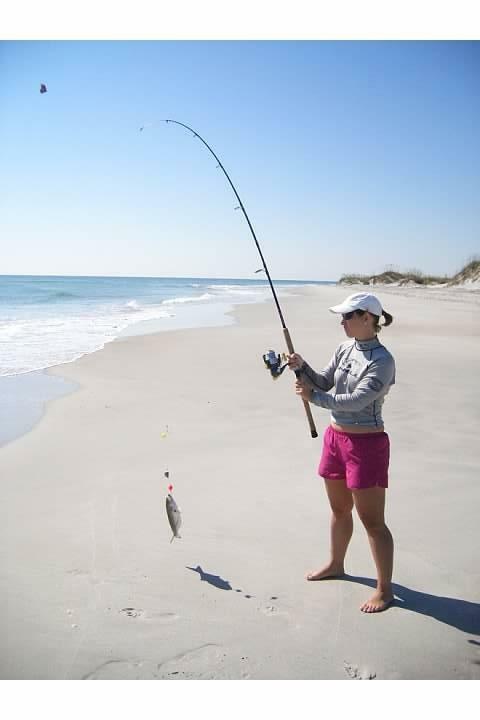 Here she had a little black sea bass…at least it is larger than the bait. You can see some of the hard bottom in this picture behind Katie. Rocks and oyster beds likely. We made our way through the marsh behind Lea Island. We saw huge crabs, skates and fish, all in just inches of water. The only way to see this place is by kayak…or wading I suppose. Sometimes, it got a little tight and we had to turn around. We found our way through the shallow creeks in the marsh. 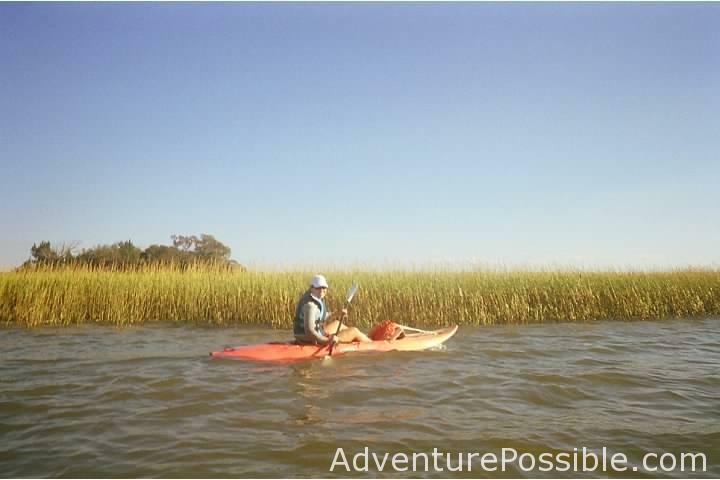 After several miles kayaking behind Lea Island and in the ICW, we passed through Rich’s inlet, the inlet between the northern end of Figure 8 Island and the southern tip of uninhabited Lea Island. Above Katie is kayaking in the ocean, a few hundred yards of Lea Island. We were really lucky, and today the sea was so calm. 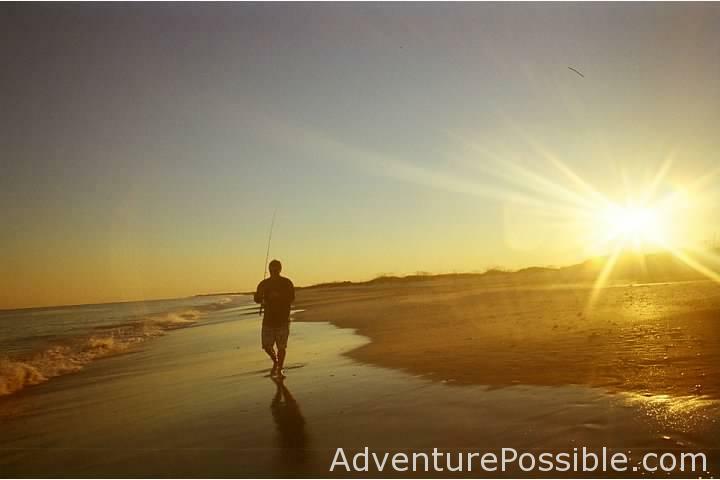 We fishing and paddled around the ocean. We saw dolphins and even a shark. Lots of activity and feeding in the water. 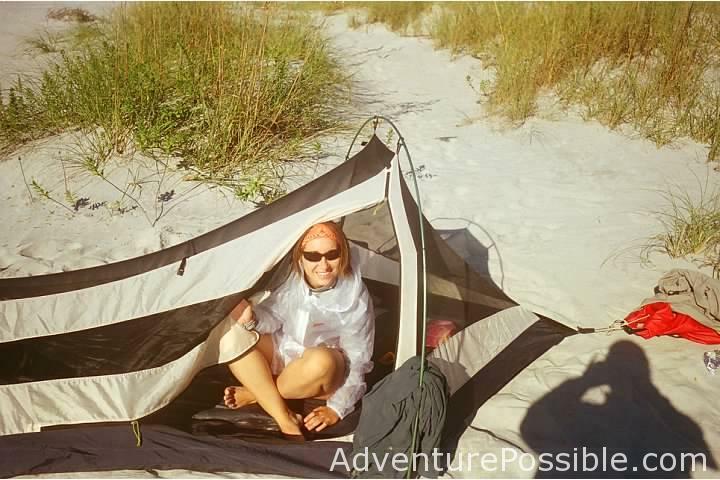 Sandy camp ground…best to keep sand out of the tent. 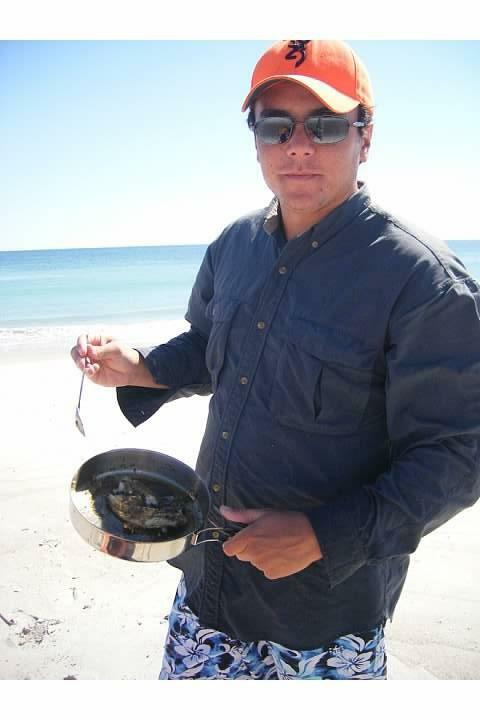 After setting up camp, I walked across the island to catch some live bait in the shallow creeks behind the island. Evenings are a great time to fish. Strong bluefish bite. 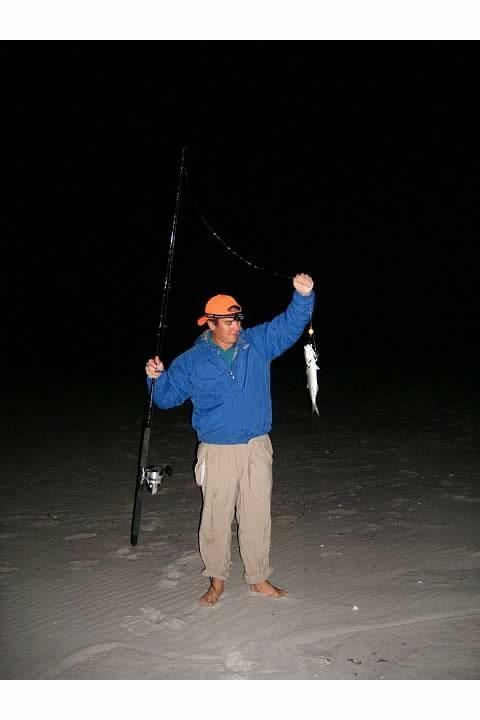 The blues were biting at night, so I caught a few for fun…Threw them back. 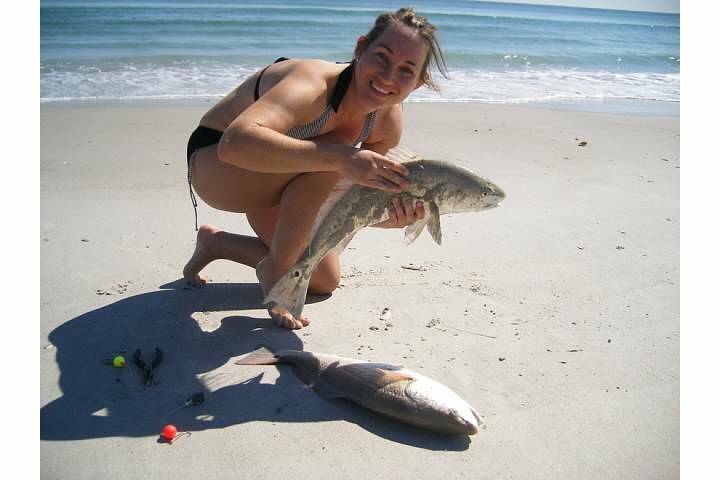 The next day…We woke early and fished basically all day on the way home. 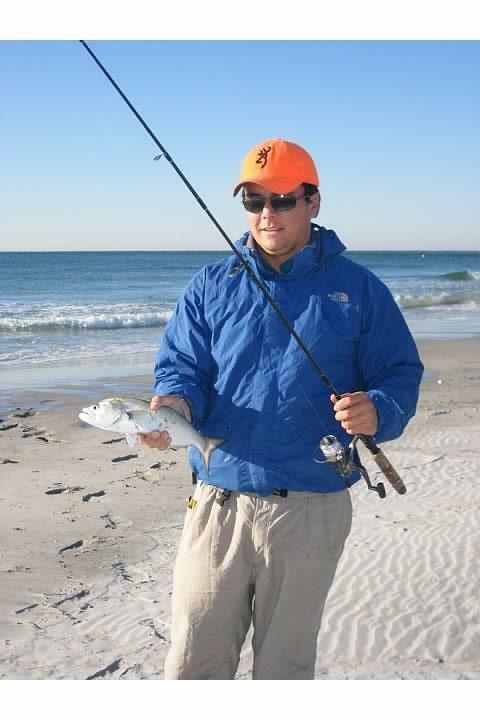 Bluefish can be easily caught in the surf with cut bait, live bait, and metal spoons, like 2.5″ Hopkins and shorties. 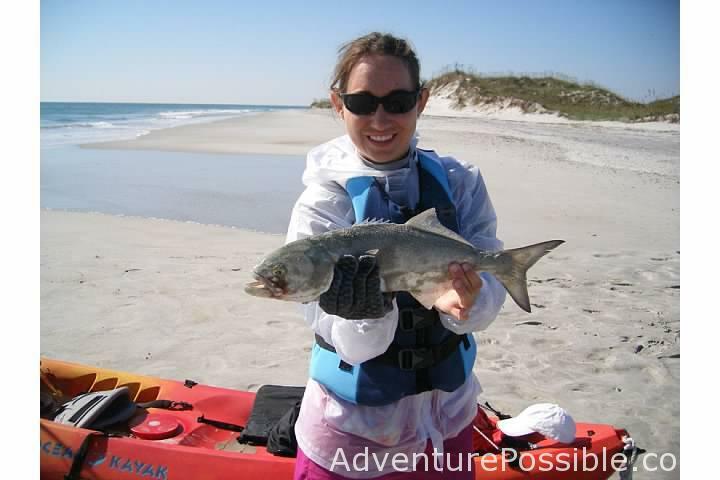 We caught some spanish when kayaking through the break on our way into shore for lunch. Filleted this Spanish while it was still alive, making for some of the freshest seafood of the weekend. 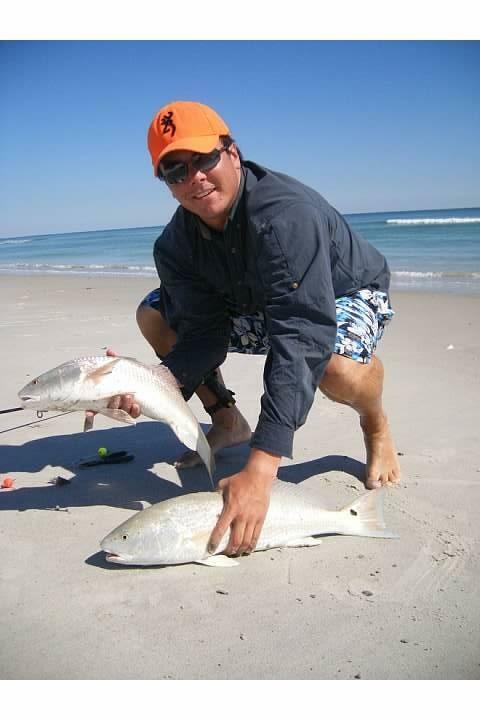 While we ate lunch on shore, a school of red drum came through the surf. I saw them coming from hundreds of yards down the beach, and they turned the water crimson and gold. We had two rods having three hooks total. We cast them into the school, and brought in three drum on two rods. Never done that before. Katie with the drum. By the way, all drum were released alive! We paddled a little further after lunch, and we made landfall on the southern tip of Lea Island. 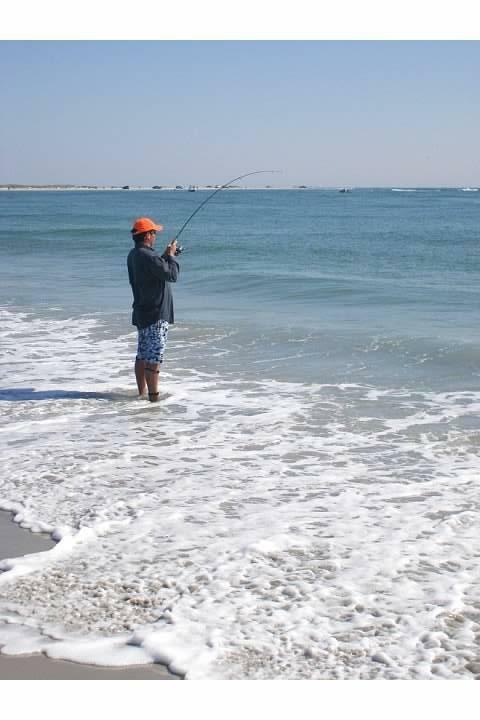 We could tell there was a lot of action in the water, so we stayed to fish before heading across the inlet to end the trip. We weren’t going to eat it, so might as well release it. 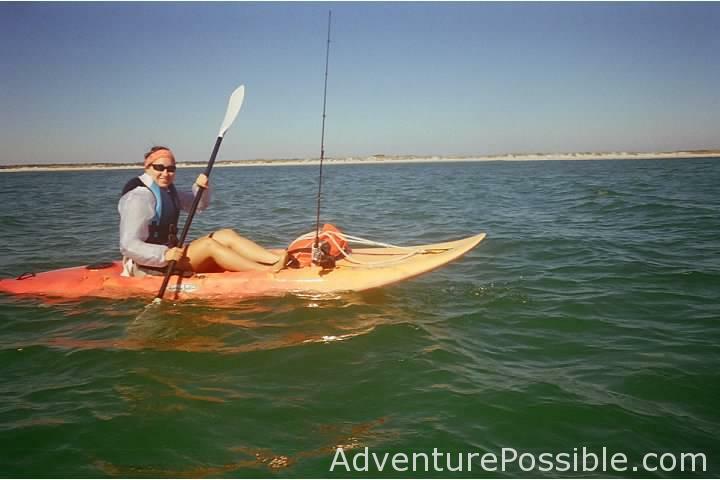 With lots of fish caught, lots of smiles, and several miles completed circumnavigating Lea Island, we paddled home. 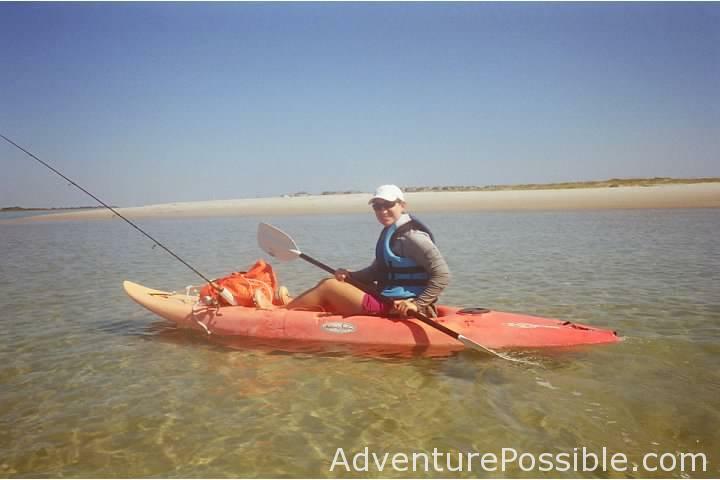 Here Katie paddled over the shallows on the south end of Topsail Island. A word of caution, the current can rip through this shallow area and sweep you out to see. Nice to read after a warm day on Lea Island.